Day 03: Kathmandu to Bhawanipati 848m. An early morning drive to Panchkhal and trek begins with a walk descending to Chak Khola and reaching at Madandaura lunch continue again walking to Indrawati River camping for overnight. Day 04: Bhawanipati to Koelphedi 970m. Following the track of two rivers Indrawati and Melamchi keeps going leftward way to Tarang Marang stop for lunch for a while. After having the lunch a continual heading for right bank later than crossing a suspension bridge camp at Melamchi River the propinquity of Koel phedi. Day 05: Koelphedi to Tarkegyang 2445m. As usual base trek starts following a an ongoing climb up to Thimbu overcoming a walk of one and half hours. A tougher inclination for Tarkegyang a potential village for performing cultural program upon a request in reture a self-effacing contribution is approving. Day 06: Tarkgyang to Melamchi 2450m. After 2 hours of descending to Melamchi River where you can rest and swim while waiting for lunch. After lunch we continue with steep climb for 3 hrs to Melamchi Gaun. 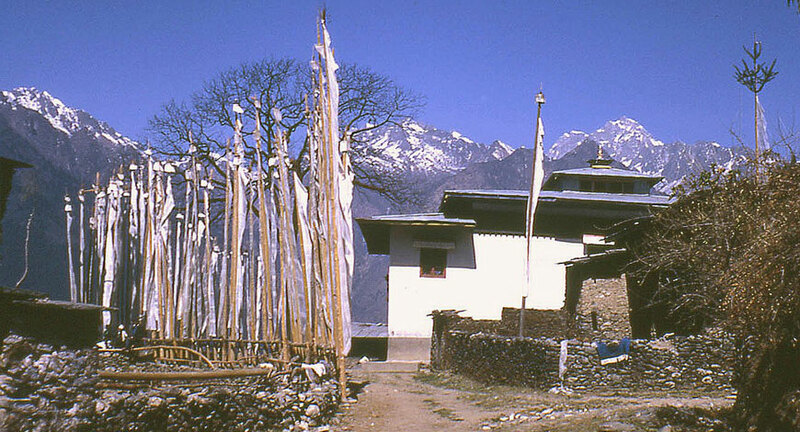 This Sherpa village has a thriving orchard. Day 07: Melamchi to Kutumsang 2450m. We descend to the stream and make a steep ascent for our lunch we take an easy walk for 3 hrs through rhododendron forest to our campsite at Kutumsang. 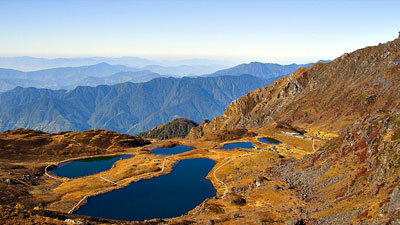 Here we have a good view of the Eastern Himalayas. 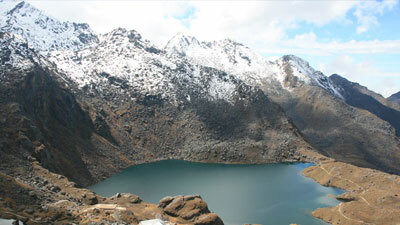 Days 08/09: Kutumsang to Golbhanjyang 2112m. Walking 6 hrs. After walking through a forest for an hour, we to descend for 2 or 3 hrs. to our campsite at Golbhanjyangdanda.Now we have a steep descend for 2 or 3 hrs. 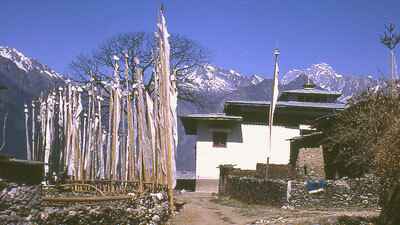 to Patibhanjyang for lunch. After that we have to a steep climb of about 2 hrs to Chisopanidanda where we have one of the best camping sites under an oak tree. From here, there are panoramic views of Mt. 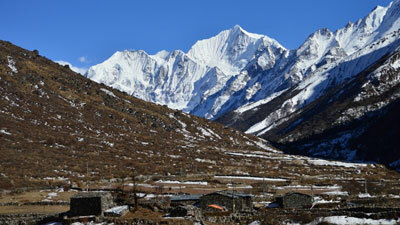 Everest, Gaurishankar, Ganesh Himal and other eastern mountains. 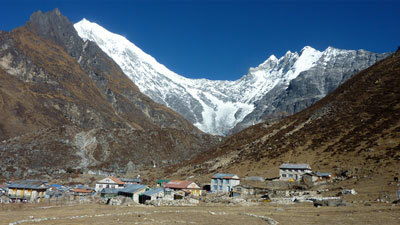 Day 10: Golbhanjyang to Sundarijal. Walking 4 hrs. Today, we have an hour's gradual climb to Maikharka. 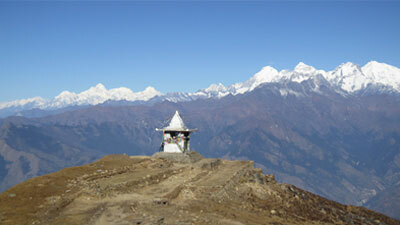 From here the route descends all the way to Sundarijal, where we meet our transrport to Kathamdandu. Day 11: Half day sightseeingin Kathmandu and in the evening a farewell dinner. Day 12: Transfer from hotel to airport for final departure.